Beautiful gardens contribute to the appeal of lovely homes in the Triangle Area of North Carolina. If you enjoy gardening, you’ll want to consider requesting some decorative concrete services from We Do Concrete Cheap. Ask us to help you design the custom garden of your dreams! Our work adds helpful conveniences, while also accentuating specific features to enhance the charm of flower and vegetable gardens. Today numerous gardeners tout the benefits of raised bed gardening. By offsetting a vegetable or flower plot within a barrier and carefully installing a tiered surface of gravel and compost layers inside this controlled, well drained area, gardeners enjoy an opportunity to cultivate more bountiful harvests. A number of companies market wooden or plastic systems for implementing raised gardening beds. Yet did you know, you can enjoy highly affordable raised bed gardening with the assistance of concrete blocks and poured concrete from We Do Concrete Cheap? Best of all, these permanent raised beds offer literally years of utility and enjoyment! Senior gardening enthusiasts sometimes discover they cannot bend over easily to tend garden plots, even raised bed plots. We Do Concrete Cheap offers valuable assistance in this situation. We’ll create raised beds for you at a table-height level, so you won’t need to sit down or stoop simply in order to sow, weed, water, fertilize, and harvest vegetable crops. Imagine the convenience of this type of gardening? You’ll enjoy the ability to pursue healthy outdoor recreation as you work outdoors without discomfort. We can even install decorative concrete along the exterior surfaces of these elevated concrete garden beds to meet your design preferences. We Do Concrete Cheap offers another product of interest to many people who enjoy spending time enjoying a garden. Whether you plant appealing flowers, tasty vegetable (or both), or you simply love the natural world, you’ll probably welcome the opportunity to spend time sitting in your garden. Savor the beauty of your work from the convenience of a built-in concrete garden bench. Once again, the flexibility of concrete as a construction material permits you to unleash your design creativity. 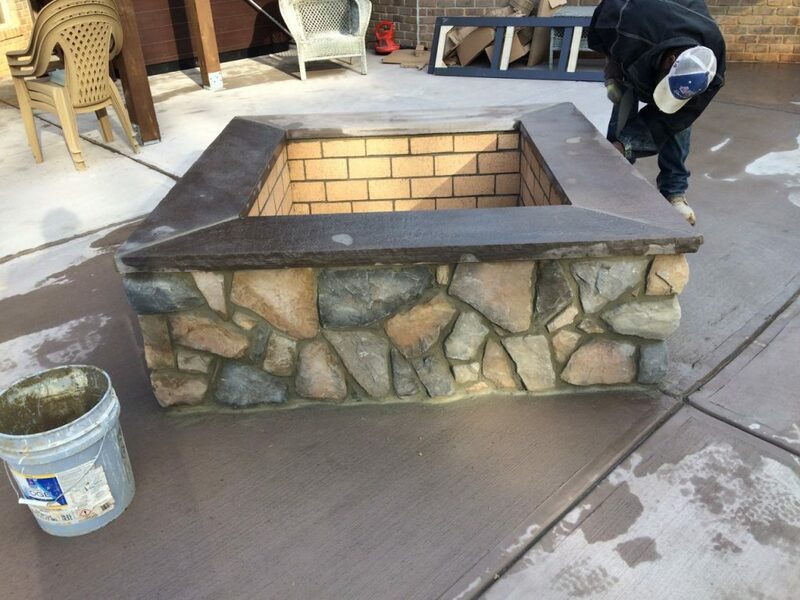 We install benches and fire pits with both functional and decorative properties. This lovely permanent outdoor furniture supplies a convenient location to keep a box of hand gardening tools within easy reach as you spend happy hours outdoors during the spring. Hillside Mowing Problems? Install a New Rock Garden With Our Help! Does your property include a steep hillock? A sharply inclined surface in a yard sometimes causes problems. If you’ve grown tired of attempting to mow one of these challenging locations, or you worry about erosion, why not consider installing a terraced rock garden there with our help? We’ll construct one (or more) retaining walls to help create a functional landscape for developing a pretty rock or terraced garden. An area which previously posed a source of grounds keeping frustration can become a lovely asset to enhance the beauty of your real estate! Just let us know the type of retaining wall(s) you prefer. We’ll install excellent, thick concrete walls, or apply concrete around masonry. If you’ve consulted about this project with a professional engineer or landscaper, we’ll work closely with them to ensure your new garden area provides a safe, comfortable site to display your gardening skills. Often simply terracing a slope increases the ease of mowing and helps prevent erosion. Rock or terraced gardens in these areas in North Carolina offer an attractive venue for showcasing a variety of plantings, including red sedum, mosses, decorative grasses, tea roses, and cascading vines. To obtain further information about these projects for your garden, or other exciting concrete home improvements, simply contact We Do Concrete Cheap at 919-454-3927. You can also reach us via the convenient online contact form. We’ll help you create the stunning outdoor landscapes you desire to embellish your North Carolina home in a lovely way!